Style and functionality unite! The modern look of this LYSS Signature V Series Chef Jacket is well worth a second glance. The decorative accent on the Left Chest Pocket gives a well stated, but perfectly subtle accent that ties handsomely with the White Cool Vent side and under-arm paneling. A Chef Works branded top snap and single row of cloth-covered buttons give the coat a stylish yet uncluttered front. 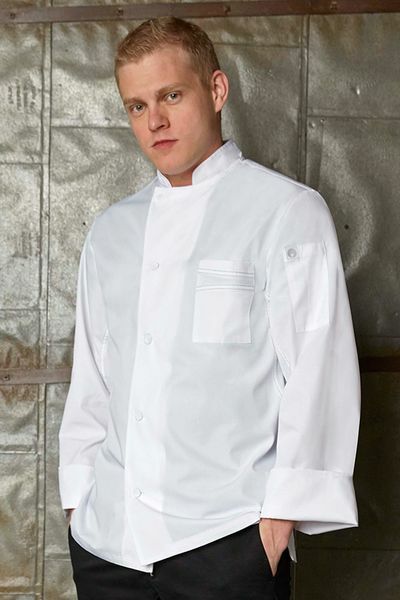 The LYSS Chef Coat is available in sizes S-2XL. (Up Size Charges apply, our system will add the following: for size XL - $3, size 2XL - $6).